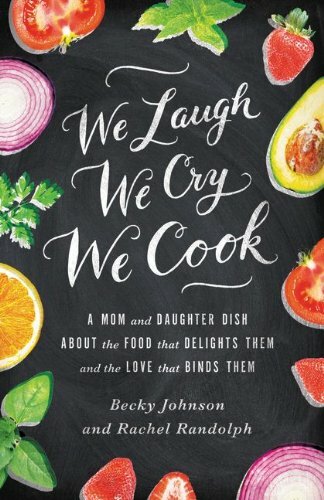 With a book deadline quickly approaching, we are going to try doing something a little different on Fridays to give us more time to write and create recipes for We Laugh, We Cry, We Cook the book. We’re still experimenting, but for now it will vary from week to week, from a featured guest blogger, to an all picture post, to an oldie-but-goodie recipe, to giveaways of books or our favorite foodie items like today’s giveaway. Like creamy spreadable gingerbread. You’ve gotta try this stuff! Yesterday, I (Rachel), shared a recipe for Pumpkin Cookie Butter Cookies, using Trader Joe’s cookie butter, a peanut-butter like spread that tastes kind of like gingerbread. Since Trader Joe’s isn’t available everywhere, I thought it might not be fair to rave about a product that some of you can’t get your hands on. My mom & lovely co-blogger just so happens to be heading to Portland tomorrow and is going to pick up a jar to give to one lucky blog reader. You can enter up to three times by doing one or more of the entries below. Please leave a separate comment for each entry. We’ll use a random number generator to pick the winner on Sunday at 9pm CST and will announce the winner on Monday. 1) *Required Entry* Leave a comment letting us know one recipe you’ve either tried from our blog, want to try, or just wish we would show up at your doorstep with it already made for you. Refresh your memory at our recipe page. NOTE: Trader Joe’s in no way sponsored this post or giveway. We simply like this product, paid for it ourselves, and want to share it with you. However, if Trader Joe’s wants to ship us a case to giveaway to our readers, we’d be open to negotiations! LOVE the recipes, the blog and those who have created it. I loved Better-than-Restaurant Chicken Tenders and Veggie Sour Cream Chicken Enchiladas (He ate every bit so I didn’t tell Terry he was eating a veggie version of his favorite Tex-Mex food – I think I’ll save that for next time I make them). I’m making Vegan Ranch Dressing this afternoon. I do menus for each month a month at a time. As I make out my August menu I find myself putting more and more of your recipes on it. I have tried many of your recipes but my all time favorite that I make at least once a month are your frozen apricot bars. They are my go to cookie when I need something sweet. Love the blog and am so proud of you both! Mac-N-Cashew Cheese! Mac-N-Cashew Cheese!! It is one of my favorites. Although I have also enjoyed your cashew con queso and there was a spaghetti squash recipe with a tomato based sauce – can’t remember the name if the recipe – that I loved. Haven’t yet tried anything on here I didn’t like! So next time one (or both) of you find yourselves in Nashville, feel free to show up on my doorstep with any of your vegan recipes! Because love isn’t an option, I like you on Facebook! I wouldn’t mind trying the Chocolate Coconut Almond Cake. Looks like it will help with the lactose intolerance. The no bake apricot bars sound like something that would go fast in my house. I’d love to have your Marinated Portobello Burger! I’ve never tried one with apple cider vinegar but this looks delish! 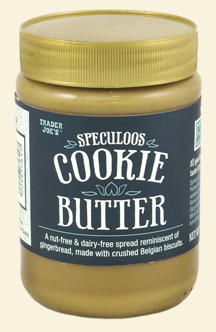 I just returned from Portland with the coveted Cookie Butter in suitcase. Rach is right, it is nothing like you’ve ever tasted. I’ve had it on a banana and last night, a little on Blue Bell vanilla ice cream and of course, just licked a spoon of it plain. Amazing stuff!